The US Department of Agriculture released their report this week adding new details to the practices at Michael Vicks’ Bad Newz Kennels in Smithfield, Virginia. Vicks, along with several others, has already pleaded guilty to federal criminal charges for running a dog-fighting ring and is expected to plead guilty to state charges, getting a three year suspended sentence. Vicks will be out of Leavenworth in July 2009. The report shows that after failing an FBI polygraph test in October 2007 the former Atlanta Falcon quarterback recanted his denial and admitted taking part in the hanging of dogs from a nylon cord nailed to a tree and drowning others in a five gallon bucket of water. Twice Vick put family pets into the fighting ring with pit bulls because he “thought it was funny to watch the pit bulls. 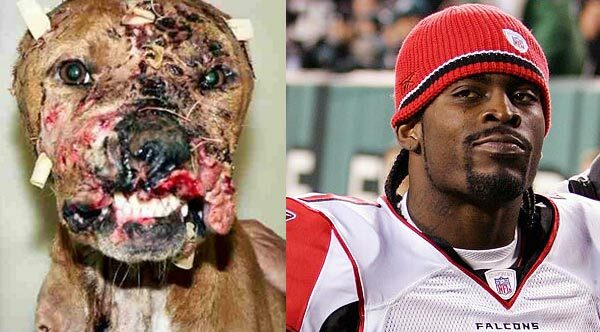 . . injure or kill the other dogs.” Vick also admitted watching his friends hang, shoot and electrocute pit bulls. For the full report go to the Smoking Gun’s site, here. To learn the details of how Vick went from being the highest paid player in NFL history in 2004, signing a $130 million contract, to bankruptcy while in prison, check out ESPN’s Harper’s Index-style run down on the numbers here. One bright spot is the $928,073 he was required to give to rehabilitate the 47 pit bulls that survived their time in the Bad Newz Kennels.